Give yourself a holiday treat with a fully narrated motor coach tour of New Orleans! You’ll pass the famous French Quarter and learn the history of Jackson Square.Then travel down Esplanade Avenue to City Park. Follow the path of our historic streetcars along Carrollton and St. Charles Avenues past Audubon Park. Also enjoy a walk through the exquisitely decorated lobby of the beautifully restored Roosevelt Hotel. Give yourself a holiday treat with a fully narrated motor coach tour of New Orleans! You’ll pass the famous French Quarter and learn the history of Jackson Square, home to the Cabildo and Presbytere Museums. Then travel down Esplanade Avenue to City Park, one of the oldest and largest urban parks in the country, which features the largest stand of mature live oaks in the world. Follow the path of our historic streetcars along Carrollton and St. Charles Avenues past Audubon Park, stately mansions of former kings and queens of Mardi Gras decorated for the holidays, and the exclusive Garden District. 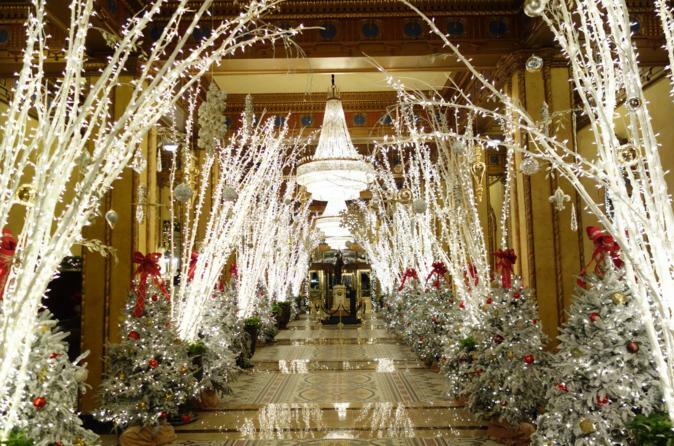 Also enjoy a walk through the exquisitely decorated lobby of the beautifully restored Roosevelt Hotel. Tour departs from the Gray Line Lighthouse Ticket Office (Toulouse St. @ the Mississippi River in the French Quarter) at 10:00am and returns at approximately 12:30pm.